The story of Crazy for Chocolate- Chocolate Chip Cookies. It’s Friday afternoon and chocolate chip cookies have been on my mind all day. I need some cookies, or in my friend Erin’s words- If I don’t get some cookies “I ‘m going to have to hurt you”. I start to get out ingredients for the usual choc chip cookies, and decide instead to try something new. Found a recipe for Chocolate Chocolate Chip Cookies, made a few changes- now they are- drum roll ….Crazy for Chocolate- Chocolate Chip Cookies. You’re going to love these! Promise. Preheat oven to 350 degrees.In a small bowl, mix together flour and soda. Cream the butter and sugars. Add the egg and vanilla, beat until fluffy. At low speed, beat in cocoa and milk. With a wooden spoon, mix in flour, soda, chocolate chips and nuts, just until blended. If dough is too dry, mix in another tablespoon of milk. Drop the dough by tablespoons onto an ungreased cookie sheet. Bake for about 10 minutes, or just until set. If using Convection setting, Bake at 350 for 8 minutes. Place 1/2 cup chocolate chips in a small Ziplock bag and microwave for 1 minute. Squish bag until all choc chips are mixed together and melted. 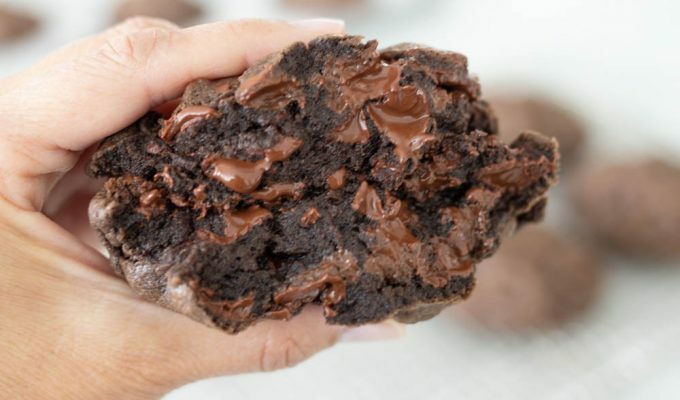 Snip off one corner of the bag and squeeze 1/2 to 1 teaspoon of chocolate on top of each cookie. Oh my word, you are killing me. I love the picture and reading the recipe made my mouth water. I’m going to have to hurt you for saying that. I would never say something like that to a friend. I’m so making these tomorrow. Si, it’s Courtney Wallace (we used to live with the Cutler’s). Laurie told me about your blog. It is as fabulous as she told me it was (is)! Thanks for posting a fabulously delicious cookie recipe…can’t wait to try it!!! Brooke told me you started a blog, so now I’m going to stalk you! You must have esp, since I made choc. chip cookies on Friday(some I hadn’t tried before)and were horrible! Thanks for this one-they look so yummy. Hi Si! I made these a couple of days ago…..loved, loved, loved them! So I don’t over-indulge in these decadent treats, I eat one or two and then….give the rest away. It’s a great way to manage my cravings for just something small and tasty. Thanks for your blog…..can’t wait to try the Blackberry Slump!Yum! Does this recipe need salt? Why or why not? FYI- I re-checked the original recipe, and it does NOT have salt listed as an ingredient. Didn;t notice that- I think I’ll add a teaspoon next time! These look soooo good and I love a good heaping amount of chocolate, however I made them yesterday and they were a disaster! It must have been something I did, though I'm a pretty good baker and can't figure out the problem. They came out of the oven flat as boards, really crispy and lacy all around the edges, then immediately turned hard and flaky. The taste was right but the texture of the cookie was awful. Could my baking soda be old? I have no idea what makes a cookie do this. I use insulated pans and silpat liners. Does that help? TTLG: thin and crispy usually means the butter was too soft, or not enough flour. Test the soda by putting a few drops of vinegar or lemon juice in a teaspoon of soda, if it fizzles, it is still good. I have had several people give me feedback on this cookie, with no problems! Did you omit the nuts? If so, you will need to compensate by adding flour to the recipe. I checked the soda and it's fine. The problem must've been the flour because I did omit the nuts and the batter was quite silky and wet – more so than I expected. That will teach me not to follow a recipe exactly! I'll try them again and add more flour next time. I just made these as pan cookies and they were a hit. Great recipe! !